Safran Aircraft Engines (Safran Group) from France and the German MTU Aero Engines company announced on February 6 a partnership to jointly lead development of the engine that will power the next-generation combat aircraft. The program is part of the Système de Combat Aérien du Future (SCAF)/Future Combat Air System (FCAS) program. The announcement was made at one of the Safran Group’s sites at Gennevillers, near Paris, in the presence of the French and German Ministers of Defense, Florence Parly and Ursula von der Leyen. Paris and Berlin also announced an initial €65 million ($74m) two-year contract to Dassault Aviation and Airbus for a Joint Concept Study (JCS) of the global architecture of this 6th generation fighter, which will be stealthier than previous designs and feature a twin-engine tailless delta configuration. The JCS is based on the binational High Level Common Operational Requirements Document (HLCORD), signed at the ILA Berlin Air Show in April 2018 between the defense ministers of France and Germany. The SCAF/FCAS will succeed the Dassault Rafale and Eurofighter Typhoon. A first prototype could fly around 2025-2026 with a full entry into service scheduled for around 2040. 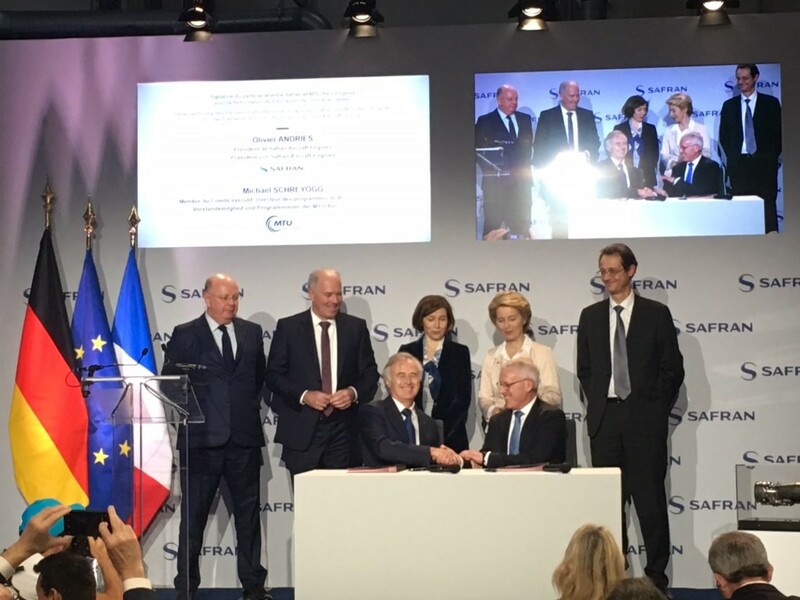 "Through this collaboration, which represents a step forward, we manifest that Safran is going to play a leading role in the construction of the European defense industry,” said Philippe Petitcolin, CEO of Safran. Reiner Winkler, CEO of MTU Aero Engines, said, “This program represents a milestone for European sovereignty in military engine technology.” Safran and MTU's cooperation began in 1962 when the companies (as Hispano-Suiza and MAN) began building the Rolls-Royce Tyne turboprop under license for Transall and Atlantic military aircraft. Cooperation continued through the 1980/90s with the MTR 390 (Tiger helicopter) and subsequently the TP400 (A400M) transport.